Holidays are a perfect excuse to decorate your garage door. Not only will it make it attractive and interesting to look at for pedestrians and cars passing by, it will also give you a fresh perception of your door. These devices make up a substantial amount of the front of most homes, and can get monotonous or fade into the background of the setup as a whole over time. With a bit of decoration, it can be given new life and once again be the awe-inspiring centerpiece it deserves to be—and the best part is that it does not have to be expensive, difficult or time-intensive. A low-impact and easy option is to go for vinyl stickers or magnets, depending on the material of the door. Metallic surfaces such as aluminum will likely accept either decoration, while other materials, such as glass or wood, may or may not let stickers adhere to them. Make sure to read the packaging of the stickers or magnets to ensure that your surface is compatible. Hearts, arrows, cupids, flowers, chocolates, letters, and all manner of other classic Valentine’s motifs can be found as stickers and magnets, and only your imagination will stop you. Put them up in imaginative ways and patterns, write a sweet message or a simple “Happy Valentine’s Day,” or do something third. Proper garage door maintenance can be a chore, but it is vital and must be carried out routinely. At a time when you want your door to look its best and contribute to festivities, a perfect opportunity to perform some much-needed maintenance comes up. Basic maintenance steps include checking and greasing all moving door parts, and giving the automatic opener some care. Make sure that nothing rattles, screeches or rubs, and check if anything else may need attention. 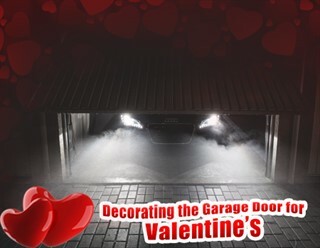 Service your garage door regularly, especially when thinking of doing something like decorating it. Depending on your setup, some decorations may get in the way when the door opens. Take a close look at how your door opens, what parts move, and how much space is left between the door and the ceiling. These observations will be a big help when you are settling on what kind of Valentine’s ornaments to put up. The sensors, located about six inches off the ground, will prevent your door from opening if blocked—check that nothing will interfere with them. Stickers and magnets are generally flat, and should not cause any problems for the opening and closing of your door.